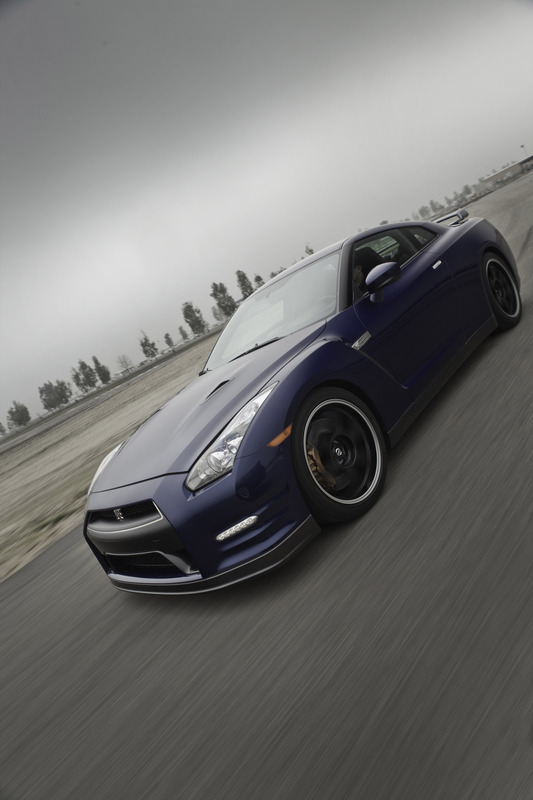 Now in its fourth year of availability in the North American market, the 2012 Nissan GT-R has a new look, new colors, new wheel design and, most important to fans of pure power, more horsepower under the hood. 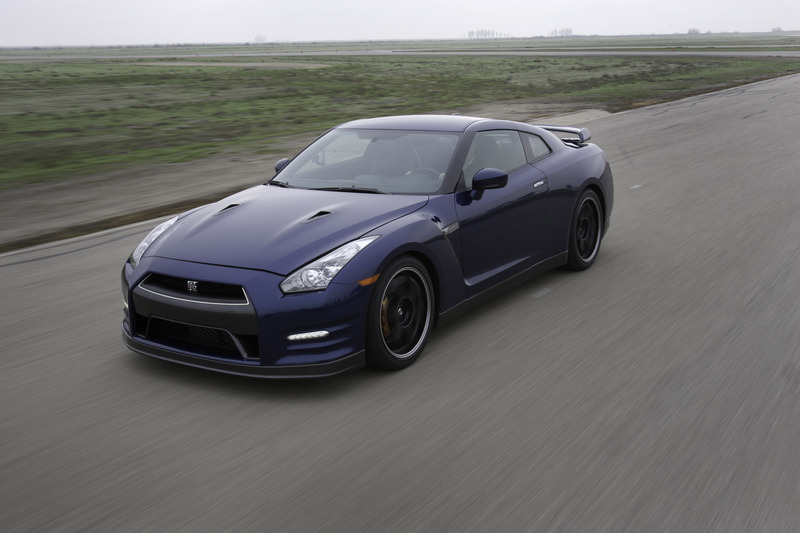 In addition, a new "Black Edition"– with unique seat trim, interior colors and wheels – joins the GT-R Premium model. 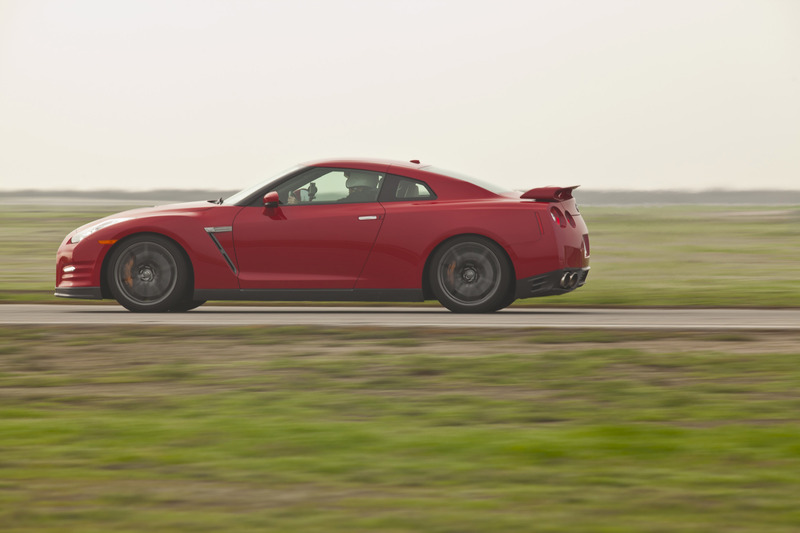 The latest iteration of Nissan's legendary supercar will be available at official "GT-R certified" Nissan dealers across the United States beginning in February 2011. 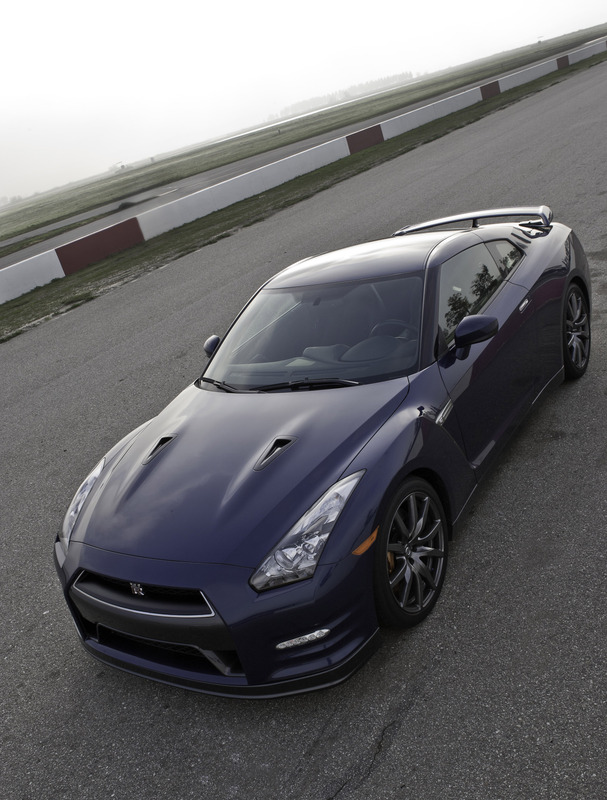 The 2012 Nissan GT-R's advanced VR38DETT 3.8-liter twin turbo V6 now produces 530 horsepower (versus the previous 485 horsepower) and 448 lb-ft of torque (versus the previous 434 lb-ft) – a result of modifying the boost pressure of the turbocharger, valve timing and air fuel ratio, and through reducing intake air resistance by enlarging the inlet pipe diameter. In addition, exhaust air resistance was reduced through use of an enlarged section of exhaust pipe. 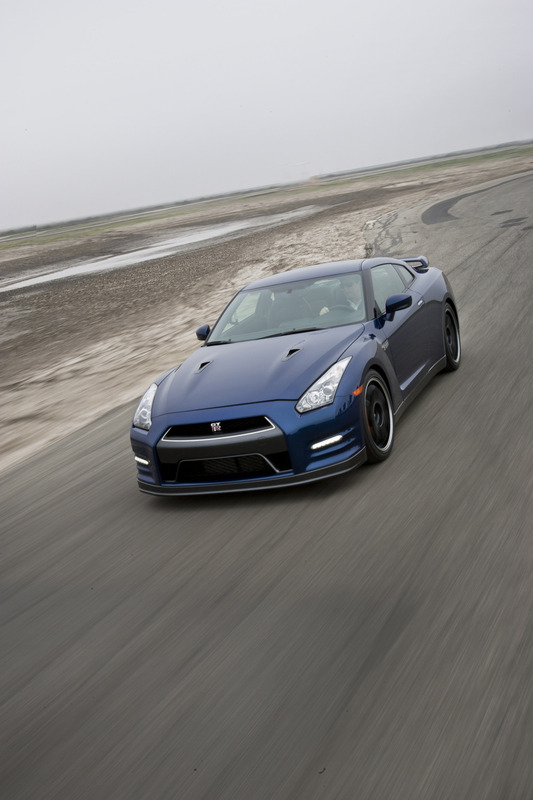 GT-R's already impressive aerodynamic performance has been improved for 2012 with downforce increased by about 10% and the coefficient of drag reduced to 0.26 (from 0.27). Enlarged fascia and grille openings also help reduce air resistance inside the engine compartment. The volume of air that passes through the radiator and cools the front brakes is also increased. These aerodynamic and engine improvements have also resulted in improved fuel economy estimates 16 city and 23 highway (verses 15/21 in previous years). The newly refreshed front fascia features aggressive double aerodynamic fins and new integrated high intensity LED running lights. Additional plated parts are used for the headlight inner panels, enhancing the car's strong visual presence. 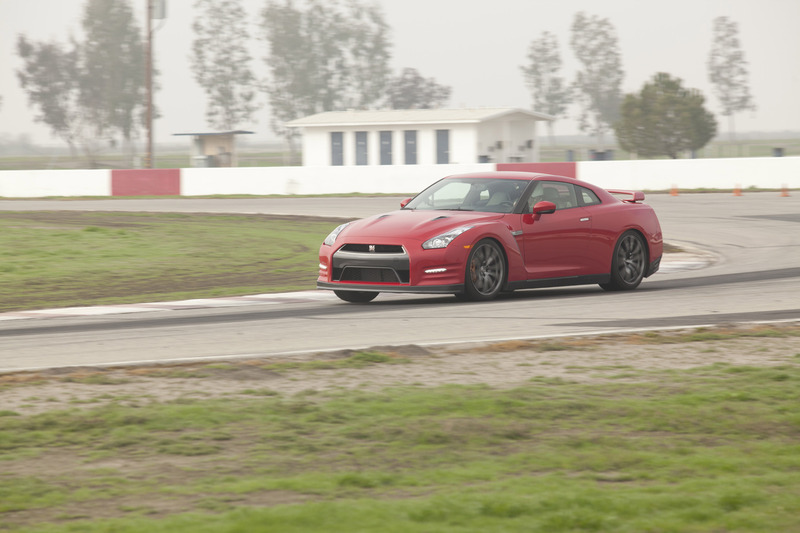 GT-R's newly designed, lighter weight and more rigid forged aluminum 20-inch wheels, once again manufactured by RAYS®, help improve suspension response. Knurling inside the wheels helps keep the tires from slipping around the wheels under heavy acceleration or braking. The wheels feature a premium dark (near black) finish, which provides a high quality, high-performance look. The Black Edition features special metallic black six-spoke RAYS® lightweight wheels in place of the Premium model's 10-spoke design. 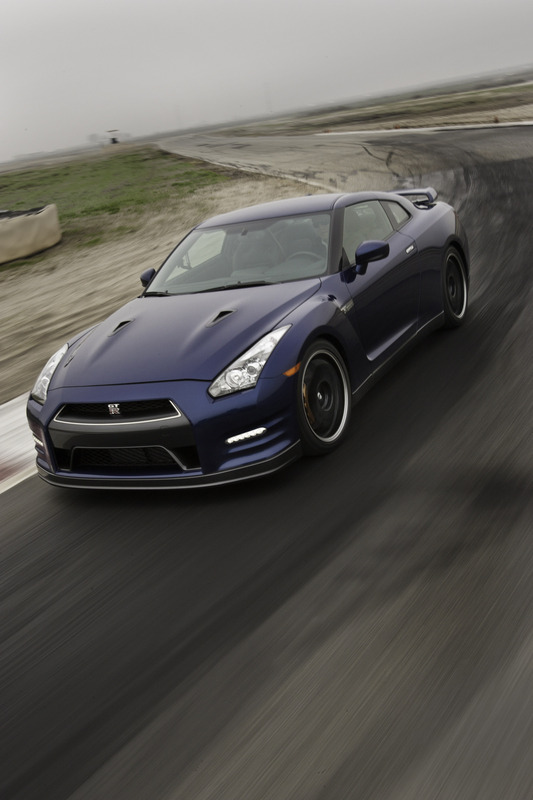 "With the enhancements for 2012, including its 530-horsepower twin turbo V6 and revised styling, the GT-R legend continues to grow," said Al Castignetti, vice president and general manager, Nissan Division, Nissan North America, Inc. "And, the new Black Edition adds an extra level of exclusivity with its unique wheel and interior color treatments." 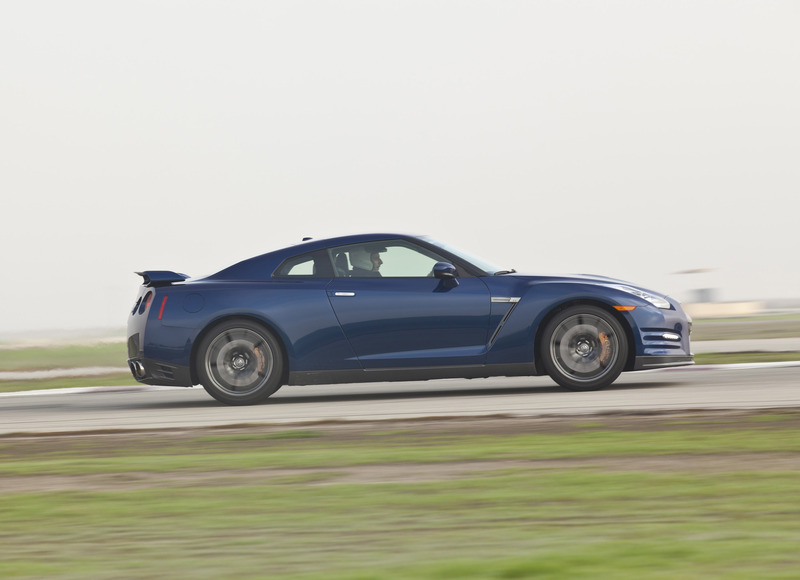 The 2012 Nissan GT-R continues as a multi-dimensional performance machine that lives up to the concept of "the ultimate supercar that can be driven by anyone, anytime, anywhere." Its Premium Midship platform was created expressly for use with the GT-R. The Premium Midship platform enables the use of a world's first independent rear transaxle ATTESA E-TS all-wheel drive system, which optimizes weight distribution and handling capability. This layout places the transmission, transfer case and final drive at the rear of the vehicle, without the use of traditional torque tubes, allowing the suspension to operate independently and optimizing tire grip at each corner. GT-R's handling duties are managed by a sophisticated 4-wheel independent suspension system mounted to high-precision six-point front and rear subframes. The front suspension geometry has also been modified for 2012 to provide more balanced handling. A special Bilstein DampTronic driver adjustable shock absorber system utilizes multiple vehicle information systems to provide appropriate damping forces and high level of control for a variety of driving situations. The DampTronic system features three driver selectable settings - Normal; Comfort, for maximum suspension compliance; or "R," for ultimate handling. The same three-stage adjustability is also available for the VDC system and transmission shift operation. 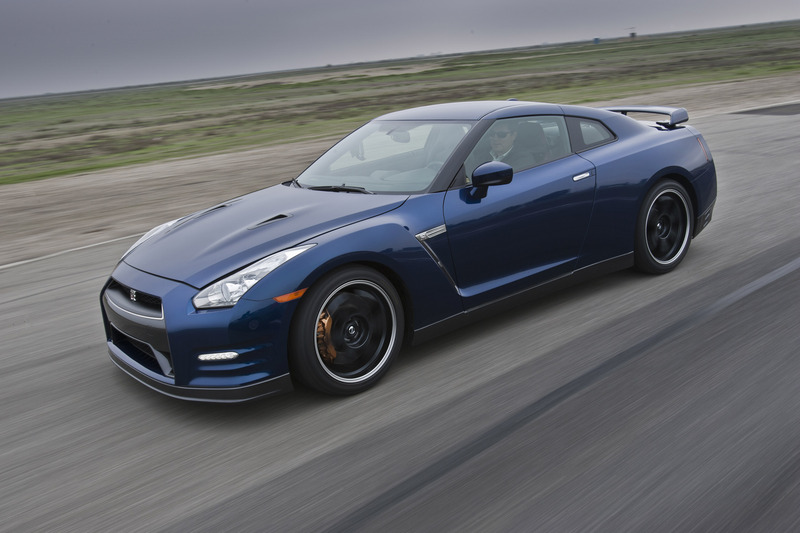 The Nissan GT-R's dramatic styling – refreshed for 2012 – again follows the "function over form" theory. Every styling aspect, from the overall design to the smallest details, is created to maximize the vehicle's driving experience – as well as suggest GT-R's "supercar" level of performance. The new front fascia is highlighted by double aerodynamic fins and integrated high intensity LED running lights. 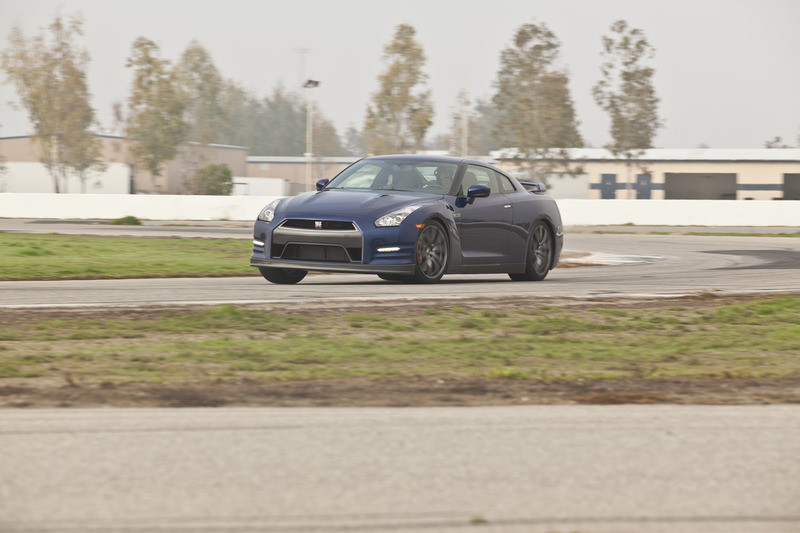 The GT-R's hybrid body construction is created with a combination of steel, carbon fiber and die-cast aluminum, providing a unique combination of stiffness, precision and lightness. The body features a lowered coefficient of drag of 0.26 for 2012 (verses 0.27 for 2011), again achieving high front and rear downforce, providing stability and handling performance in a wide range of driving conditions. GT-R's front fenders express power and stability, while the "aero-blades" on the fenders' edges provide optimum airflow around the tires and along the body. The vents in the fenders' trailing edges assist in providing front downforce and optimizing side air flow. The aggressive front end, with a large hood bulge and enlarged central air intake for 2012, provide a sophisticated style as well as undisturbed airflow for power and cooling. The "super wide beam" headlights feature three additional sub-reflectors (compared to conventional lights) to give a wide illumination spread. The speed-sensitive windshield wipers include an auto on/off feature. The Nissan GT-R's four-passenger cabin features a sloping "aero blade canopy" roofline and a curved C-pillar "sword edge," which expresses the distinctive GT-R identity, as well as facilitating air flow around the rear of the vehicle. 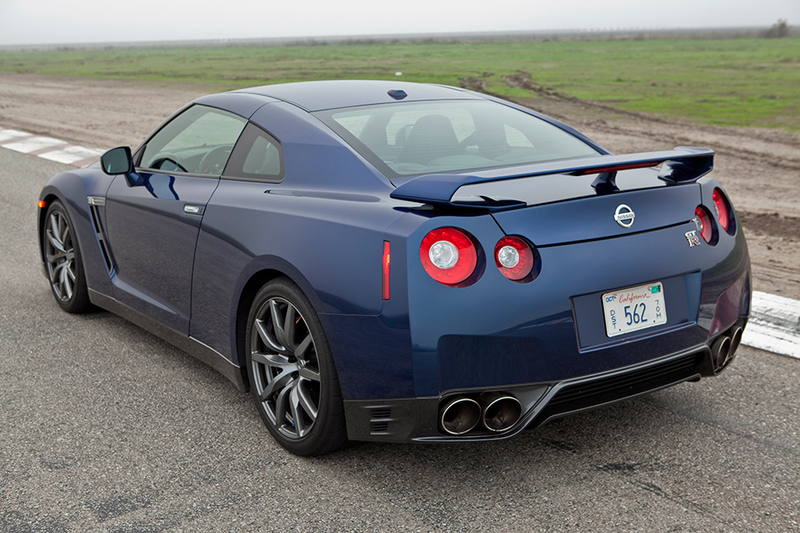 The signature rear view of the GT-R is provided by its hallmark four-ring taillights, while air flow above and below the vehicle is managed by the functional rear carbon fiber underbody diffuser (extended for 2012), new rear venting, rear spoiler and large, integrated quad exhaust tips. GT-R's advanced technology is present even in the vehicle's paint, which utilizes a durable anti-chip paint and "double clear coat" process. The 2012 color palette includes two new colors, Deep Blue Pearl and Jet Black, along with Solid Red, Gun Metallic, Pearl White and a limited production 4-stage metallic Super Silver. Key to the Nissan GT-R's usability as both a daily driver and a high-performance machine is its interior, which is designed to balance functionality and comfort. It provides comfortable four-passenger seating and trunk capacity of two golf bags or suitcases. The GT-R's cockpit-style instrument panel surrounds the driver, with all meters and multi-function meter at a uniform height to minimize the driver's head movement. A large center-mounted tachometer, with gear display on its upper right, as well as the easy-to-read graphics of the display, gives the driver instant detailed information, essential for the performance nature of the GT-R.
Functional style is also evident in GT-R's interior – each meter features a dial plate design that evokes the idea of engaged gears, as well as a three-dimensional metal-like ring, suggesting the multi-dimensional performance of GT-R. A large, metallic-framed center console features an ergonomically designed shift lever and a red "engine start" button. The Nissan GT-R offers a long list of safety features, including, for enhanced visibility inside and out of the vehicle, high-mounted LED stoplights, bright LED rear combination taillights, "super wide beam" headlights, heated door mirrors and flat-blade windshield wipers. 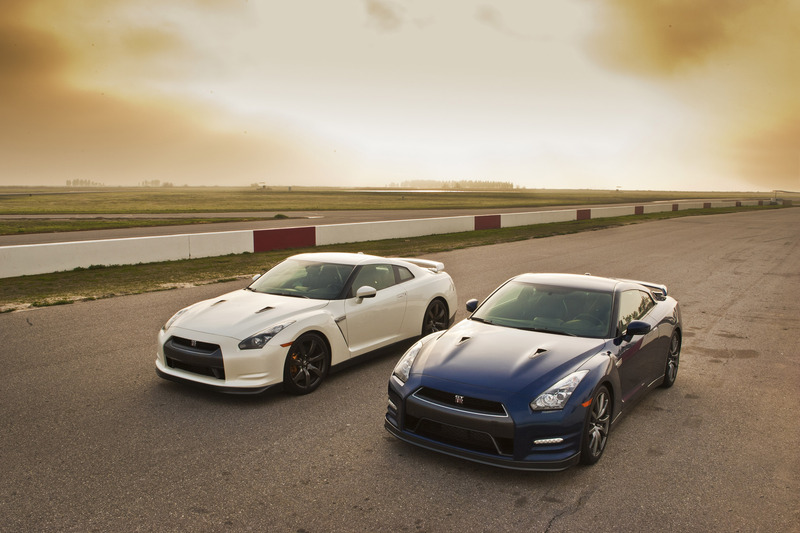 The Nissan GT-R is sold and serviced through nearly 700 Nissan dealers that have attained "GT-R Certification" status by meeting a number of strict sales, service and facilities commitments – including dedicating a master technician to GT-R service, special training for service managers and technicians, and designating dealer principals, executive managers and general managers as the primary communicators and negotiators in sales transactions. 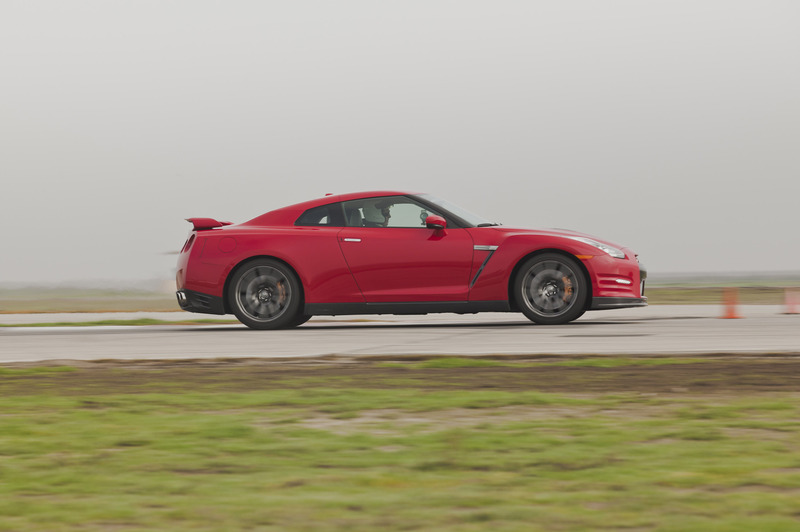 The names and locations of local GT-R Certified Nissan dealers are available to consumers on NissanUSA.com.